McCauley & Co.Capitalism is Dead. What’s Next? - McCauley & Co.
Alexander McCobin talks to us about seismic change in corporate culture. Alexander McCobin has the business world’s ear, and they’re paying attention. If you’re not familiar with his name yet, you will be. Alexander and his team from Conscious Capitalism are connecting with CEO’s and leaders all over the planet and helping them create a brave new world. And it’s working. Just recently, Larry Fink, CEO Blackrock, asserted that capitalism as we have known it must – and will – change. His annual letter to CEOs of public companies was a call to action. It’s time to re-examine the purpose of business and its role in society, and Larry Fink expects the companies Blackrock invests in to lead the charge. Those that don’t…well. Adapt or die, right? Larry Fink and many other corporate leaders are choosing conscious capitalism to map the future growth of their companies. This stakeholder centered business strategy is not only turning out to be a defining shift in global mindset – it very well could be a pivot point in human social development. 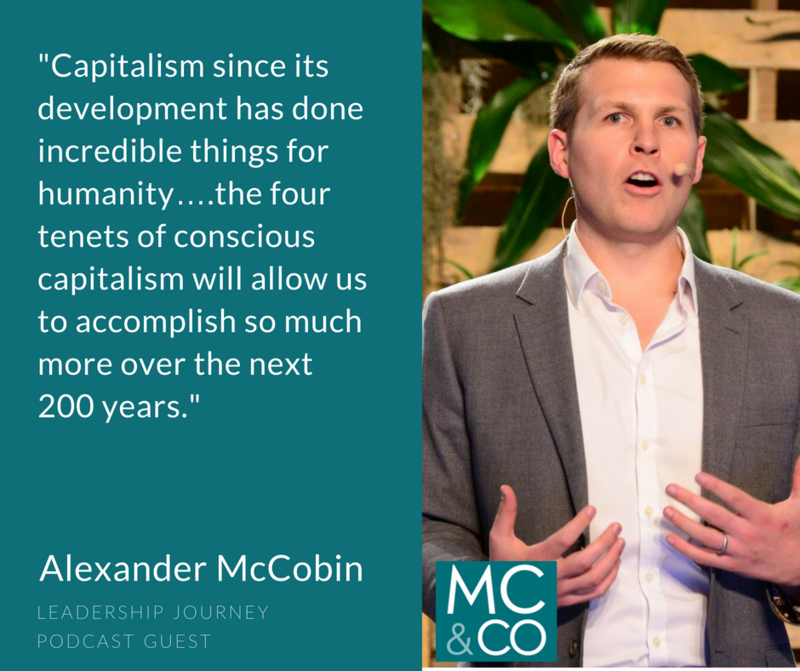 Alexander McCobin is the CEO of Conscious Capitalism, an organization founded by John Mackey the co-Founder of Whole Foods with a singular goal, “liberating the heroic spirit of business”. If the term “conscious capitalism” seems like an oxymoron, or an anti Wall-Street Millenial movement, this episode is for you. Alexander joins Kelli in this podcast to discuss how and why corporate leadership is making this shift, and why the traditional perception of profit vs. the common good is now antiquated. Still a skeptic… here’s a shortlist of companies that have embraced the Conscious Capitalism model, Blackrock, Whole Foods, The Container Store, Motley Fool, Which Wich and many more. Barrons: Blackrock’s Larry Fink: The New Conscience of Wall Street? Read more on the topic of eliminating poverty – can it really be done by 2030? Skeptical? Read the Forbes article from March 2018: A Former Skeptic Explains Why Conscious Capitalism Could Save the World.